In order to label with bottles, bottle sticker labeling machine is been used with its advanced features that delivers efficiency and effectiveness in the production process. The bottles are been placed in a sequence on the machine and is processed for labeling. The machine labels the bottle one by one. Depending on the product requirement the conveying system of the machine is adjustable. There are different types of bottle sticker labeling machine that are been used for labeling bottles of different shapes and size. Round bottle labeling machine is used to label cylindrical bottles used in industries like beverages, chemicals etc. It is used to label various kinds of materials like glass, plastic, HDPE, LDPE, PET, etc. Labeling machine like position bottle labeling machine are used to label ampoules, vials, bottles, jars, container, canisters etc. 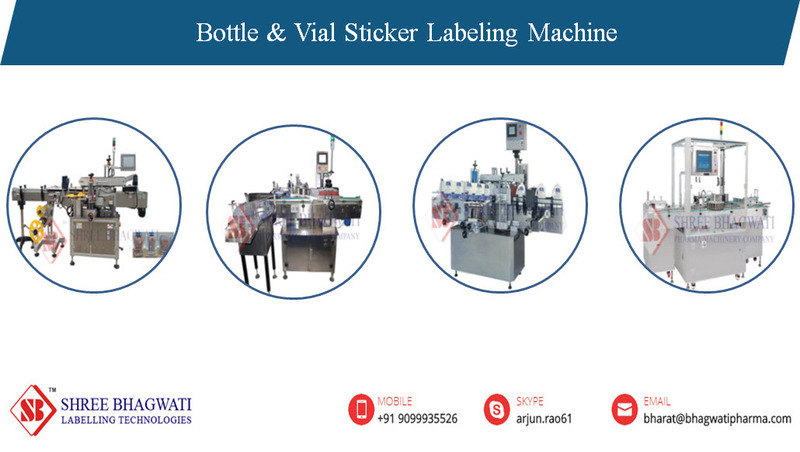 Bhagwati Labeling is a manufacturer and exporter of sticker labeling machine used in industries. We offer labeling for various types of containers as well as different types of surfaces. Our labeling machines manufactured with advanced technology helps to achieve good application speed as well as accuracy for labeling of products Other labeling machineries includes induction cap sealing machine, top labeling machine, shrink sleeve applicator, single side and double side labeling machine and many more. For more information about machineries contact us today and get acquainted with about how they are used in industries for labeling.